I was hoping to kick off the Huge Grab Bag of Gaming Goodness tomorrow, but Christmas weekend is just too busy for me to pull it off. So it will kick off on Monday and it will accept comments through Wednesday. What is going to be in it? Even I'm not sure. Rach thinks it will require at least 2 boxes to send out (yes, these are duplicates from my collection) and the plan is for the Post Office to pick up a bunch of mail next Thursday or Friday. There is certainly a complete set of Castles & Crusades Core books (the green covers - not even sure the edition) and a bunch more from the depths. 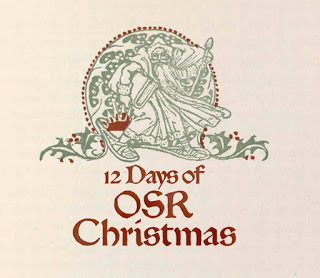 I'm sure some Tunnels & Trolls will slip in ;) Only shipping to the States, as it will be insane otherwise, but this was probably the most Worldwide Friendly OSR Christmas that has run so far. I'll certainly be posting this weekend, but it will have to squeeze into the "moments between"
Merry Christmas to you and yours, sir. Thank you for everything you do here at the Tavern. Thanks for doing this Erik! ...said in my "Mr. Incredible, you're the best," voice. Merry Christmas, and thanks again for Castle Amber! Merry Christmas and sign me up sir! Thanks for the opportunities for gifts. Merry Christmas! so generous and now this! way to give back.